Vice City, 1984. Opportunity abounds in a city emerging from the swamps, its growth fuelled by the violent power struggle in a lucrative drugs trade. Construction is everywhere as a shining metropolis rises from foundations of crime and betrayal. As a soldier, Vic Vance has always protected his dysfunctional family, his country, himself. One bad decision later and that job is about to get much harder. Kicked out onto the streets of a city torn between glamour and gluttony, Vic is faced with a stark choice - build an empire or be crushed. Crime, drugs, car jacking, prostitutes, cops and murder... are the basic elements of the highly popular Grand Theft Auto series and once again, those "crazy" guys at Rockstar have come together to release another exciting and addictive installment of this ground breaking series. This my friends is GTA: Vice City Stories. The latest hero or "anti-hero" of the series is Vic Vance whose life is thrown into turmoil after being dishonorably discharged from the army for drugs while trying to assist his socio-economic impaired family. 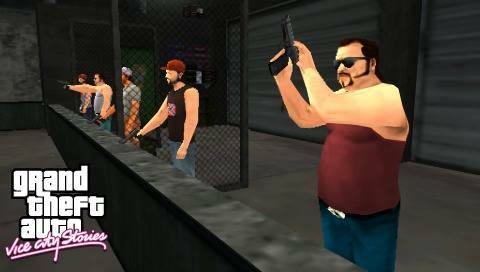 Fortunately for Vic Vance, the streets of Vice City are a mean place, however if you know the right people (or morally wrong people), these streets can virtually be a smorgasbord of cash and women. For those that are unaware of the gaming formulate behind the series, the concept is simple yet the world is vast, varied and amazingly entertaining. The player must work their way through a variety of missions from assisting with drive by shootings, saving drugs from a burning factory or taking a lady of the night to your boss, these missions are guaranteed to entertain. 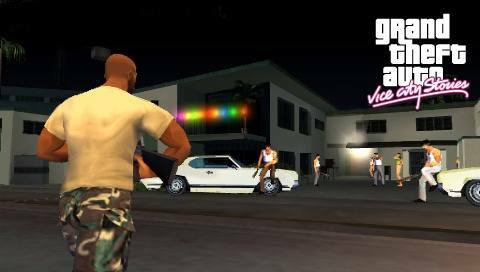 Whether you're on foot on within a vehicle, the gaming world of Vice City Stories is massive and there are virtually thousands of characters to interact with, hundreds of hidden items, dozens of secret missions and of course your main storyline that Vic Vance so valiantly follows. As with the PlayStation 2 version, the developers have ensured to take all the best concepts of the previous games (especially Vice City) and then implement new aspects from other titles into one sturdy game, all in the palm of your hand with no loss to gameplay, graphics or sound. The control system of Vice City Stories is perfect and the unlike the previous installment on the PSP, the control system is more sturdy and adaptable for the player. The main control system is the analog stick for movement and the d-pad to perform a variety of options such as attack, jump, use and run. Ironically, it's easy to control the vehicles in the game, then the main character on your foot but it's nothing too major to stress about. Graphically, Vice City Stories is a visual treat on the PSP that contains extremely detailed environments, characters and special effects. Even the draw distance and level-of-detail are almost on par with the PS2. Although it should be noted that certain sections do struggle with the framerate, however it is fairly decent throughout the game. Those whacky shock jocks and radio stations have also been implemented onto the PSP version but after a while, repetition does come into play but considering the amount of audio that has been implemented, the developers have done a wonderful job. In conclusion, Vice City Stories is great that I would recommend to anyone who loves the GTA series and just can't get enough. If you were scared away by the previous PSP version, the problems have been addressed and this is one title that should be on your Christmas wish list!